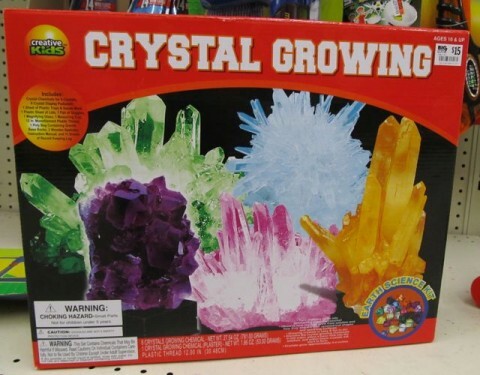 Big Lots Presents Crystal Growing! SO I WAS AT MY LOCAL BIG LOTS the other day shopping for a recliner that’s entirely upholstered in that thin, webby, cheap fabric that quality furniture manufacturers use on the underside of their furniture; a rocking recliner that turns out it isn’t supposed to rock, just that whoever put it together in the back room didn’t tighten any of the bolts enough; you know, a recliner that has – instead of an actual handle to activate the reclining action – a recessed plastic ring that snaps off irreparably within about the first month of use. I think that about covers it. And I thought to myself, “Now who the hell around here is going to buy that? !” Because in this neighborhood, brother, in this neighborhood, the kids already know how to make crystal! Jot that one down on a couple of index cards and you’re all set for next week’s Toastmaster meeting. Posted by Ted on January 27, 2012, 1:00 AM.